Flu season is upon us. Am I going to get it? Nope! Not going to do that. Cold season? No, get outta here with that stuff. Feeling achy? Sniffles? Congestion? Don’t have time for it! There’s no guarantee, of course, but I’m doing everything I can to keep the sickness ‘bugs” away from our door. How, you might be asking? I’m preparing as much healthy produce as I possibly can and shoving it into our mouths 2-3 times a day. In the morning it could be a green smoothie, for lunch a salad with both cooked and raw veggies, throw in some citrus for good measure; and for dinner at least two veggie side dishes per meal. I haven’t fallen in love with every combination I’ve put together, but there have been several that I will be making again. This is one of them. Parsnips are a late fall vegetable, harvested after frosts have set in, as they need the cold weather to convert their starches into sugar. They are not a vegetable that I cook with any frequency, since up until now, I hadn’t found a way to prepare them that was terribly appealing. In this dish, however, the parsnips are combined with sweet potatoes; two vegetables that each have their own kind of sweetness. Roasting them concentrates and blends their flavors, and then just before serving you pour a simple glaze of honey and Dijon mustard over them and toss to coat. Well, that sauce is the magic that makes this dish sing. I went from “not sure I’m going to like this” to “Wow, I love these”. As I write this, it’s two days since I made the original dish and this evening I’m making it again. That’s how much I loved these veggies. And Mr. D. loved them too!! So I know I’ve got a winner in this dish. Won’t you try it and see if you agree? 1. Preheat oven to 425*F. Line a baking sheet with foil or parchment paper. 2. Prepare the vegetables. To cut parsnips: Trim tops and bottoms; peel, and slice in half crosswise to separate thick and narrow parts. Halve or quarter thick parts lengthwise, until all parsnip pieces are roughly the same size. Then cut on a diagonal into 1/2-inch-thick pieces. Cut the narrow end from the thick end, then quarter the thick end. To cut sweet potatoes: quarter them lengthwise so they are about the same thickness as the parsnips, then cut crosswise into 1/2-inch thick pieces. 3. Put the parsnips and sweet potatoes in a large bowl, and add the olive oil, salt and pepper. Toss to coat evenly. Spread in a single layer on the prepared baking sheet. Spread seasoned veggies on a baking sheet. Roast until tender and golden, tossing once or twice, about 30 minutes. Transfer into a serving bowl. 4. In a small bowl, stir together honey and mustard. Whisk together the honey and mustard. Pour over vegetables, toss to coat. Sprinkle with parsley, if desired. Serve immediately. Isn’t this dish brightly colored and beautiful? I mean… vitamin C, vitamin A….. There’s no way a cold is getting us down. Knock on wood! Sausage, zucchini, and feta casserole. We had this dish for dinner on a recent evening and once again I am in awe of how such simple ingredients can meld together and produce such an outstanding meal. It is a pasta casserole that combines pantry items with fresh vegetables for a hearty, family-friendly meal. 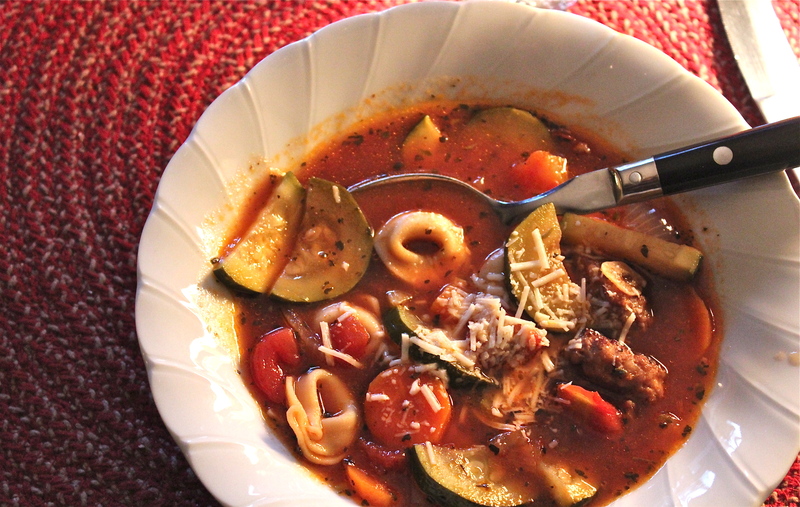 Any leftovers are even better the next day as the flavors have time to meld. The edges of the pasta get brown and crispy with cheese. The recipe as I originally found it calls for 5 cups of thinly sliced zucchini as the main vegetable, but whenever I see an amount like that for one item I immediately think of it as 5 cups of ANY vegetable or mixture of vegetables. Given that I had only 1/2 a zucchini on hand, I knew I would need to add other vegetables to make close to the quantity the recipe specified. So I added 6 stalks of asparagus, chopped into 1/2-inch pieces and a medium carrot thinly sliced, plus the onions called for. 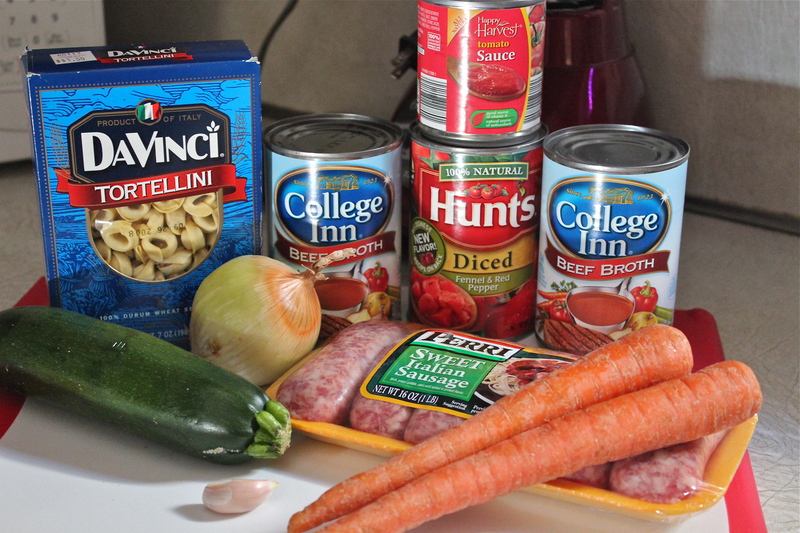 These, the pasta, and 1/2 pound of sweet Italian sausage were the main ingredients that I used to make this casserole. The recipe makes about 6 servings, so for two of us, there was enough for another meal, and it reheat easily in the oven covered with foil so it remained moist. My husband commented twice on how good it was and how much he enjoyed it. With that kind of reception I can’t wait to make it again. 3. Remove casings from sausage. Heat a large nonstick skillet over medium-high heat. Coat pan with cooking spray. 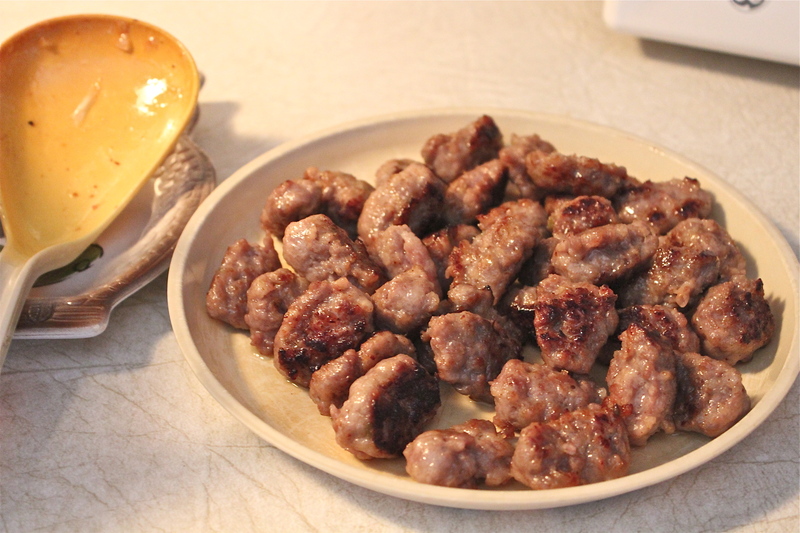 Add sausage to pan; cook until browned, stirring to crumble. Remove from pan. Sauteing all the vegetables together. 5. Combine broth and flour in a small bowl, stirring with a whisk. Add broth mixture to pan; cook 1 minute. 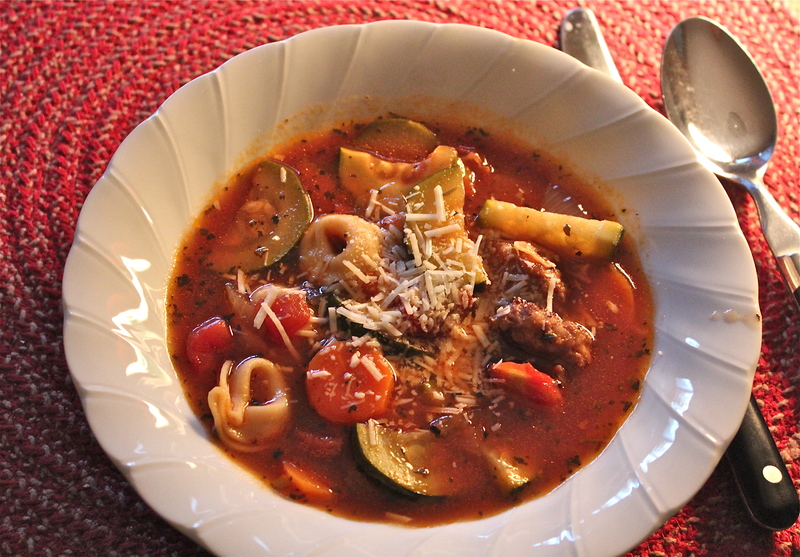 Combine zucchini mixture, pasta, sausage, and feta cheese in a large bowl ( or pan pasta was cooked in ); toss well. Spoon pasta mixture into an 11 x 7 – inch baking dish coated with cooking spray. Sprinkle evenly with mozzarella cheese. Mix pasta with vegetables and sausage in a baking dish. 6. Bake at 400*F for 20 minutes or until bubbly and lightly browned. Serve with a salad for a complete meal. 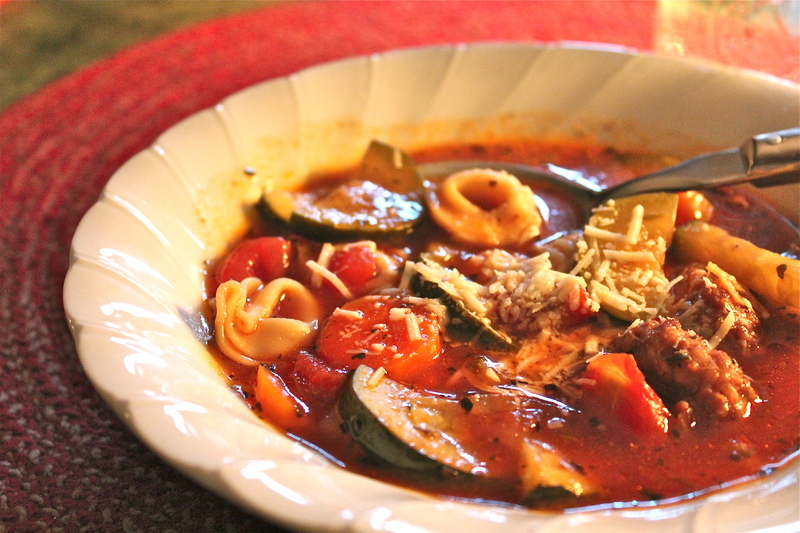 A quick post today featuring a soup that I made this past weekend when I had an abundance of broccoli and cauliflower on hand that needed using up. After spending the morning outside spreading mulch and pruning some shrubs, Mr. D. and I were starving and ready for a break. 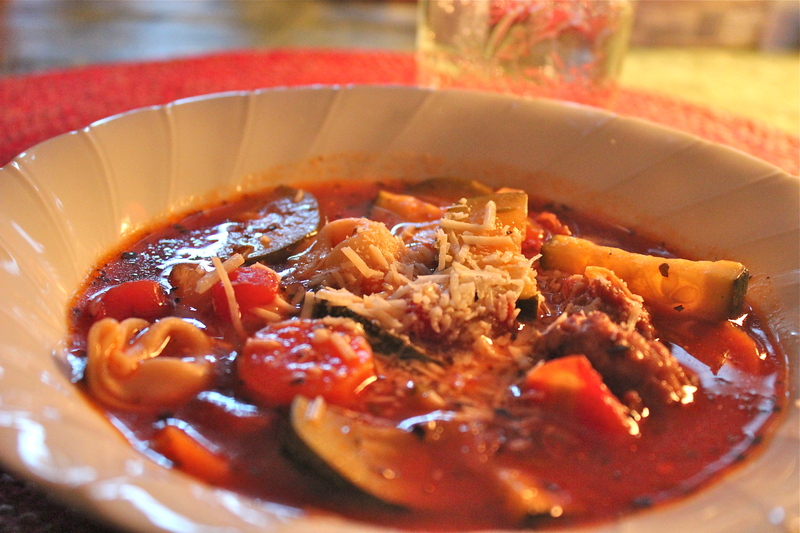 In just about 30 minutes I was able to have this thick, vegetable soup on the table ready for us to devour. If you use frozen vegetables it takes even less time to make. 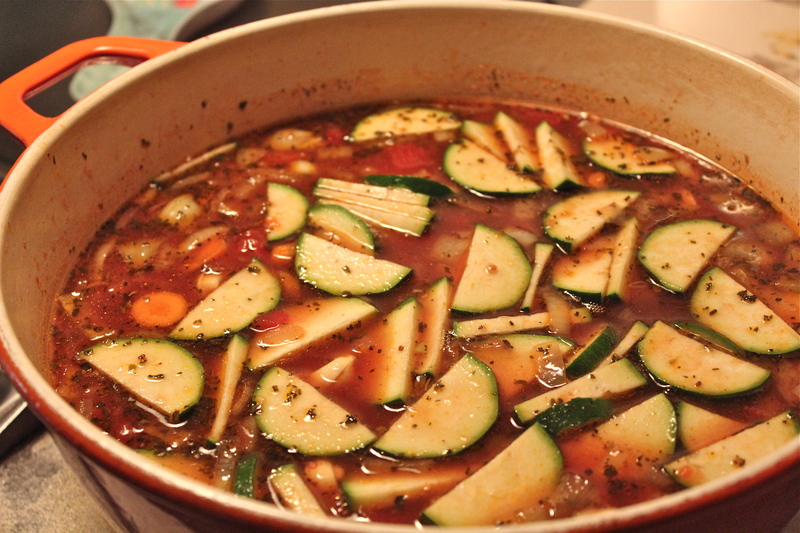 I didn’t realize a “made from scratch” vegetable soup could be ready in such a short time, and be so delicious. It has only 150 calories per serving, and is low in fat and carbohydrates, yet satisfies and is filling. 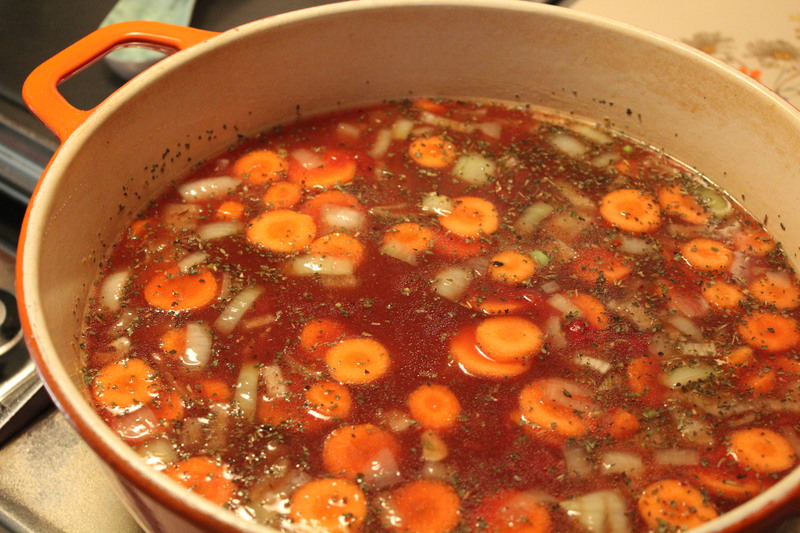 To make it vegetarian, switch out the chicken broth and use vegetable broth instead, and omit the cheese. 1. 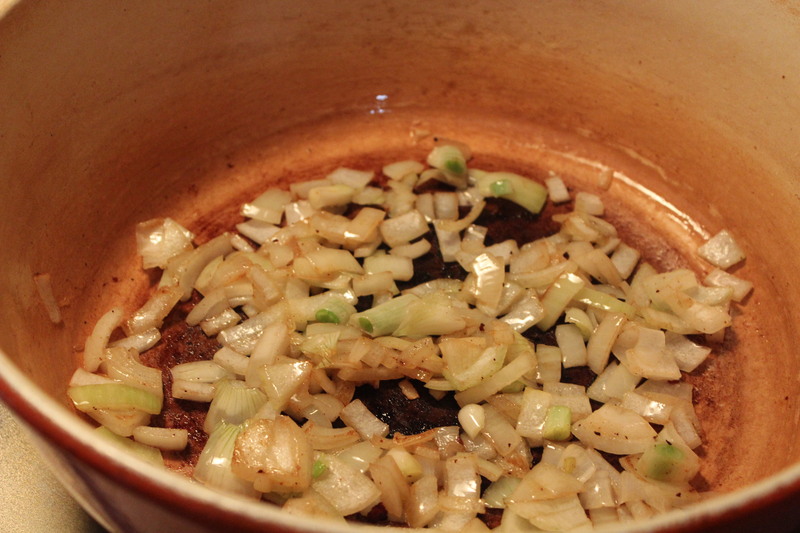 In a large saucepan, heat oil over medium heat, add onion and cook until just beginning to brown. Add garlic and continue cooking until onions are lightly browned. 2. Add chicken broth, broccoli and cauliflower; cover and bring to a boil. Reduce heat and cook for 10 – 15 minutes or until vegetables are tender. 3. Puree mixture with and immersion blender or a regular blender. Return mixture to saucepan, add milk and heat through. 4. Remove from heat and stir in cheese. Season with pepper. Sprinkle each serving with nutmeg and garnish with a few seasoned croutons. Quick to make; filling and nutritious. Seasoned croutons add a little crunch to an otherwise smooth soup. Nutritional Profile: 150 calories, 6g. fat. 2g saturated fat, 15 g. carbohydrates, 4g sugars, 8g protein.